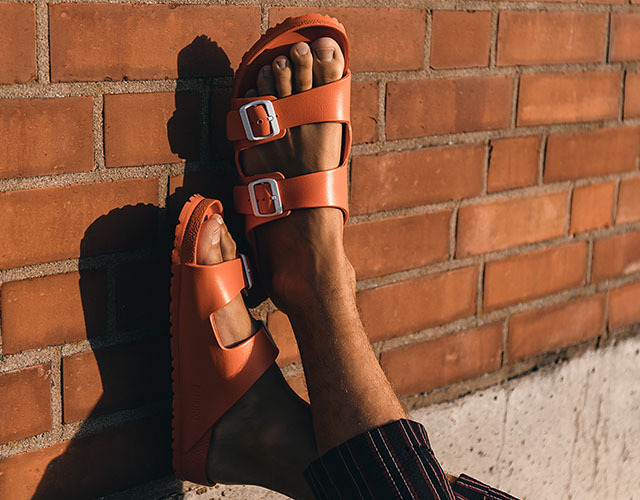 Trends, events, and inspiration from the world of BIRKENSTOCK. We'll discuss fashion topics from around the globe, showcase our favorite new styles, and tell the inspiring stories behind the people from our community in our BIRKENSTORIES series. … is about diversity and character featuring authentic individuals in their own BIRKENSTOCKs. 2018 sees a momentous encounter between two unique names. BIRKENSTOCK, synonymous with supreme foot comfort, will debut a limited edition collection with Königliche Porzellan-Manufaktur Berlin – the Royal Porcelain Manufactory Berlin, home of exquisitely hand-crafted porcelain since 1763. Our guest author and style expert Dominik H. Müller took some time out of his busy schedule to show us some looks he styled for himself and his mom, at his parents’ home in Hesse, Germany. Berlin based style expert and blogger Dominik H Müller and Model Lisa Bärmann demonstrate how good both men and women can look in unisex sneakers. BIRKENSTOCK BOX opens in Milan in collaboration with 10 Corso Como. Our guest author and style expert, Dominik H. Müller, hit the Big Apple this summer. Here he shares his impressions and discoveries, and offers some styling tips. Caroline Issa was in Berlin for Fashion Week and the opening of the first BIRKENSTOCK BOX. Together with our style expert Dominik H. Müller we are offering styling tips for men of all ages. His stores transformed fashion into art and space into an adventure – Andreas Murkudis is Berlin's curator of beautiful things. In collaboration with our guest author and style expert Dominik H. Müller, professional photographer and lifestyle blogger, we present some first-hand styling tips and discuss the latest trends. The editors of the HIGHSNOBIETY magazine picked out the most desirable styles from the BIRKENSTOCK. We reveal who and what is behind the recordings for our Srping/Summer collection 2017. We also show impressions of the shooting in London in a making-of-video! The AnOther magazine team explore the endless ways in which to style a Birkenstock. On June 13, 2018, journalists, buyers and stylists were immersed in what was surely the loveliest oasis of tranquility anywhere at the Pitti Uomo men’s fashion week. In the Torrigiani Gardens, centrally located near Florence, BIRKENSTOCK presented its Spring/Summer 2019 Collection. An event that elevated the humble picnic to new dimensions! Japan’s fashion scene and BIRKENSTOCK came together in Tokyo to celebrate craftsmanship and heritage. For the first time, BIRKENSTOCK was a supporter of the annual Whitney Art Party and collaborated with American artist Trisha Baga. Kirna Zabête-founder, Beth Buccini, adds a special touch to the iconic Arizona sandal. It was Murkudis who curated the first selection for the Box, which includes the Arizona limited edition. On June 24th, 2017 the first event was hosted by BIRKENSTOCK at Paris Men's Fashion Week. The Galleria Rossana Orlandi is considered to be one of the most popular meeting places at the Salone del Mobile in Milan - the most important furniture fair in the world. Exactly here, we presented the new BIRKENSTOCK sleeping systems. After a few crazy business ventures, father of four Geoff Higgo now runs an unusual car hire company in Cape Town with his partner Monika. He has worn nothing but Birkenstocks on his feet since 1986. “But always the Milano!”. Mariah Nielson’s father was the sculptor J. B. Blunk, a “master of the chainsaw.” She tells us about her father’s legacy – and how Birkenstocks became an integral part of the family. Matto Barfuss, successful wildlife filmmaker, achieved fame in the 1990’s after spending months living among cheetahs. We caught up with Matto in the Kalahari Desert in Botswana, where he is shooting his latest film, about meerkats; and despite sometimes challenging environmental conditions, is always wearing his Birkenstocks. Romany Pajdak decided she wanted to be a professional dancer at the age of ten. She is now one of the best ballerinas in the world. We met her and her 15-year-old Birkenstocks in London. „I’ve been wearing Birkenstocks for 45 years,” wrote Bernd Brinkmann. We met the man who has been a Birkenstock fan from the get-go – and a person who has demonstrated the ability to make a comeback in life. Proponents of sustainability are in the right place in Portland, Oregon. This is where the autodidact and manufacturer of top-notch traditional straight razors Scott Miyako lives. We visited Scott, who wears Birkenstocks out of conviction, and spoke to him about quality and sustainability. The ginger beer she wanted didn't exist that's why Rachel Marshall decided to make it herself. Six years ago she founded Rachel's Ginger Beer - and now she employs 80 people. We met Rachel in Seattle where she told us her Birkenstory. He already has more than a million subscribers to his YouTube channel, his videos have been watched by hundreds of millions of people, and a recent highlight was him being interviewed for the legendary magazine Rolling Stone: Cole Bennett is a music-video director from Chicago with his own platform for artists called Lyrical Lemonade. Jeff Wears Birkenstocks? written by the world-famous punk rock band NOFX. The first thing we asked ourselves was “Who is Jeff and does he really exist?”. So we began to dig around a little. The Bavarian with Nigerian roots works as an event manager in Dubai. We spoke with Florian. Without a doubt, Johannes King runs one of the world's finest and most beautiful Michelin-star rated restaurants/hotels. We visited him at this incredible property, Söl’ringhof, in Rantum on the island of Sylt. Thomas is CEO of the company Unicat and has a passion for building individual expedition vehicles. We had the chance to visit him at his unconventional office. Hanna is a master tailor and fashion designer. We caught up with the pleasant designer at her studio in the trendy Glockenbach neighborhood of Munich.